CrimeFighters is an action comedy set in the sleepy town of York, England and tells the story of three bored friends swept into vigilantism to protect their small town from a wave of inexplicable crime. Ella (Emma Keaveney), Pip (Paul Trimmer) and Daisy (Debbie Hard) are determined to make a change from their repetitive lives, soul-crushing jobs and frequent trips to the pub when their plans are thwarted by an unexpected crimewave that sweeps them up into vigilantism to protect their once peaceful town. As they don masks and face thugs, muggers and their newfound fans, the trio of friends find that even vigilantes have to deal with their everyday problems. Complicating things are Pip’s crush on pretty law student Sophie (Georgina Hope), Daisy’s failing relationship with her boyfriend John (Steve Joiner) and Ella’s romantic entanglement with local policeman Ethan (Harry Humberstone), not to mention her creepy boss Curt (Curt Milner) following her every move. 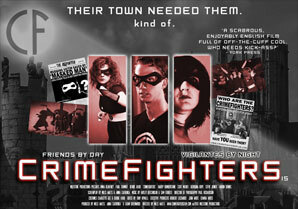 With sly nods to comic books and pop culture, CrimeFighters is the second feature film from writer/director Miles Watts and the first feature film made entirely in York, shot on a microbudget with high production values and showing in beautiful black and white that not only is the city Yorkshire's answer to Gotham but that it contains a wealth of filmmaking talent within its walls.